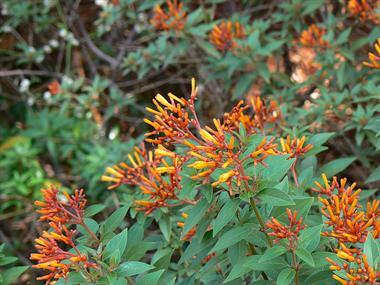 The Firecracker bush has brilliant red/orange flowers that attract hummingbirds. 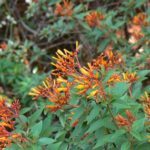 It is a semi-evergreen bush, medium growing bush with summer blooms . It does well in full sun or partial shade. It grows 4′ x 4′. Low litter, no thorns, and hardy to 25 degrees.